Colm O'Donnell from Aclare, Co. Sligo, Ireland is a traditional musician and singer who plays flute and tin whistle. Colm O'Donnell, outstanding singer, gifted musician, lilter, and music composer, was born in the parish of Kilactigue, Co. Sligo in 1962. With the release of Farewell to Evening Dances, a trip to Sligo will not be required to experience the music of this All-Ireland artist. It contains a broad, interesting cross-section of material. Newer tunes in the traditional idiom include two lovely reels, The Road to Monalea and Up Spincin, composed by Colm The heartfelt slow air) An Tonn Amplach (The Hungry Sea) is another O'Donnell composition. Colm's songs are suffused with a ring of authenticity. The title Farewell to Evening Dances, is taken from the song The Hill of Knocknashee, a sentimental and lyrical ballad of exile. Colm's singing style is sweet, tuneful and full of soul. His songs could be described as nicely understated, yet full of warmth and feeling. His flute and whistle playing is lively, bouncy, and varied, ornamented in the great North Connaught tradition. Colm is a flute player's flute player, a superb singer and composer, a shepherd and a breeder of sheep dogs. What else do you want? Buy this CD now! A couple of highlights: a beautiful version of "Erin gra Mo Crhoi" (Ireland love of my heart), and Colm's own air "The Hungry Sea", done on low whistle, will take your breath away. This is an amazing album from a little-known Irish flute/whistle player and singer. I heard about it from a message board for whistle and flute players, and I'm so glad I bought it. I agree 100% with the other reviewers on this page. 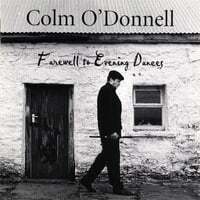 I hope that Colm O'Donnell will release another album soon. I can't recommend this enough for those who like traditional Irish music. I think Colm O Donnell is a fabulous singer and musician. It is such a pity that he is not better known. I am finding it very hard to obtain his other albums in the shops in Mayo. They tell me they just cant get them. I play this album on a continuous basis and absolutely love it. I think it portrays the real spirit of traditional singing. Best wishes to Colm and I would love to know when I could see him live in the Connaught area. This CD is an inspiration for whistle and flute players and especially those like myself who are in the learning process, thank you.